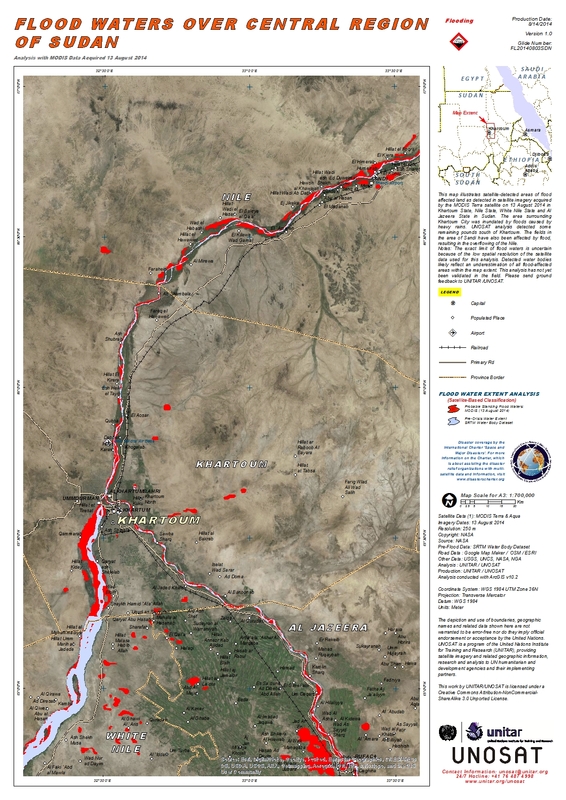 This map illustrates satellite-detected areas of flood affected land as detected in satellite imagery acquired by the MODIS Terra satellite on 13 August 2014 in Khartoum State, Nile State, White Nile State and Al Jazeera State in Sudan. The area surrounding Khartoum City was inundated by floods caused by heavy rains. UNOSAT analysis detected some remaining pounds south of Khartoum. The fields in the area of Sandi have also been affected by flood, resulting in the overflowing of the Nile. Notes: The exact limit of flood waters is uncertain because of the low spatial resolution of the satellite data used for this analysis. Detected water bodies likely reflect an underestimation of all flood-affected areas within the map extent. This analysis has not yet been validated in the field. Please send ground feedback to UNITAR /UNOSAT.